When San Francisco dad Ben Brucker encountered the extremely puffy Baby Merlin’s brand sleep suit, he knew it could do more – and even be more, Mashable reports. With a little help from Amazon (hello NASA and astronaut-themed patches!) and a little of the old needle and thread (thanks Ben’s mum! ), Ben realised his baby astronaut ambitions in crafty style. The whole operation was done stealthily, while Ben’s wife, Emily, was at work. Needless to say four-month-old Mya was totally in on the gag. While my wife was at work today, I had some fun modding our daughter’s Magic SleepSuit. Ben explains that the dimensions of the suit lent themselves to some serious galactic modification. “Our 4 month old keeps waking up all night long in her crib. This sleep suit is supposed to help her (and us) sleep better,” Ben posted on photo sharing site Imgur. Luckily, Mya’s grandma was on the design team and had a way with haberdashery and the like. 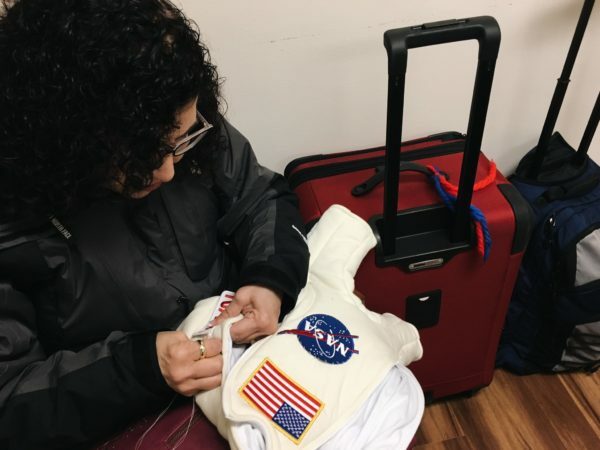 “My mom was in town visiting, so I asked for her help sewing the patches on. Here she is finishing up the last patch just in time before catching a ride to the airport,” Ben wrote. There was apparently a method to the madness when it came to the placement of the suit’s badges. “We had to sew the larger patches on the front instead of the arms so we wouldn’t impede her movement. The American flag was the only one that would cover the Merlin logo,” Ben explained. “She’s trying to figure out why I’m laughing so hard. We’re ready for orbit. She’s waiting in anticipation for her mom to come home and find her like this,” Ben posted. The extremely proud – now fashion designer – dad filmed her response to his suit mod. We’d be chortling too. 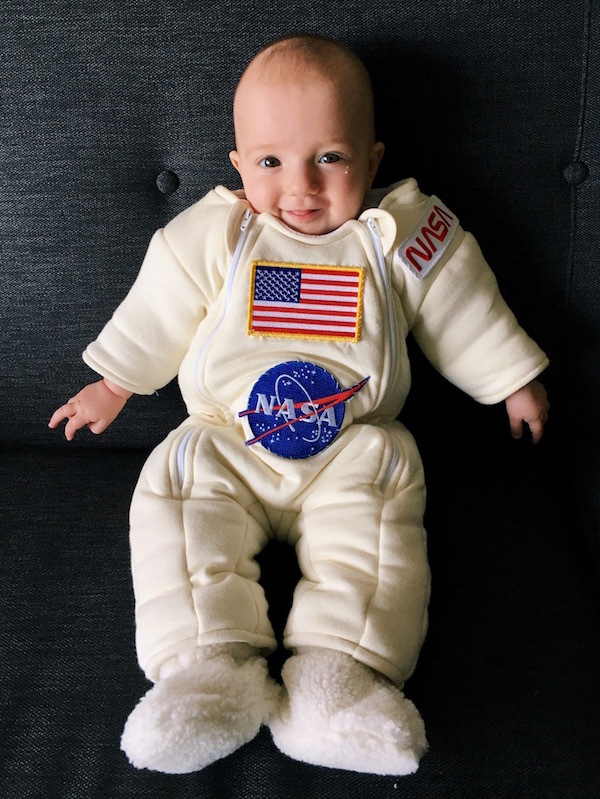 We’d also need to instantly dress our baby up as an astronaut. But that’s just us. Nice work Ben, Mya and Grandma!